Not your average noodles…this recipe uses zoodles, which is zucchini made into noodles with this. Topped with Asian style shrimp to perfection. Preheat a large skillet or wok over medium high heat. Cook, stirring occasionally, until onions are slightly translucent ~3 minutes (be sure not to cook onions all the way through just yet as they will be in the pan until shrimp and zucchini are also done cooking). Add Shrimp and the second tbsp of sesame oil. 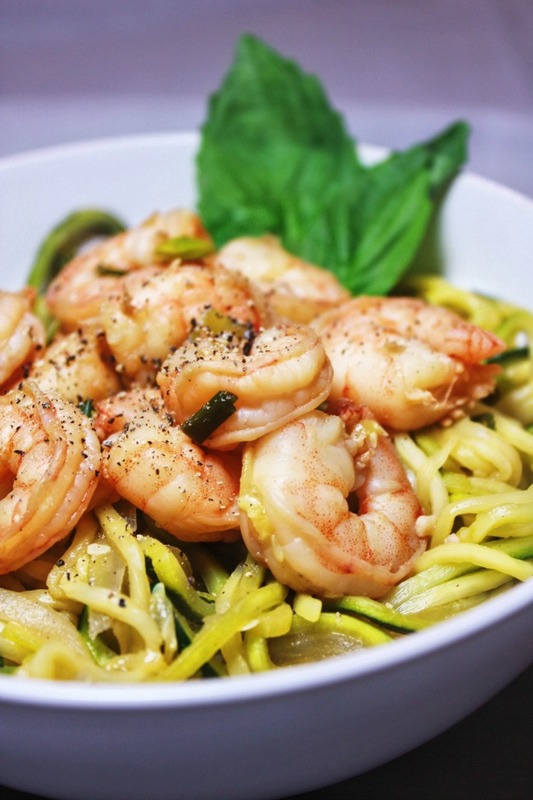 Once shrimp are completely cooked, add spiralized zucchini and garlic to the pan and cook for 2-3 minutes or until zucchini noodles soften and are a yellowish color. Pour mixture from step one over the Zoodles and shrimp and toss to incorporate.